There are only 25 elephants left like him in the world. A beloved elephant with beautiful tusks was shot dead by a trophy hunter in Zimbabwe late last month — and people everywhere are mourning the loss. Called a "big tusker" because of his long tusks that practically reached the ground, the bull elephant was being studied by researchers who had fitted him with a radio collar. But that didn't save his life. 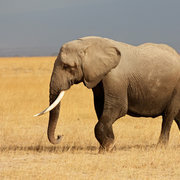 And there could be as few as 25 big tuskers left on the planet. “There is no law that protects a collared animal from being hunted in Zimbabwe," the Frankfurt Zoological Society (FZS), which was studying the animal, wrote in a statement about the animal's death. "But there is general acceptance that the ethical position is that a hunter will avoid shooting an animal with a collar." Because of the ivory trade and habitat loss, elephants are dying far faster than they are being born — if nothing changes, they could go extinct in our lifetime. The death of a big tusker removes strong genetic strands from the gene pool, further threatening elephants. 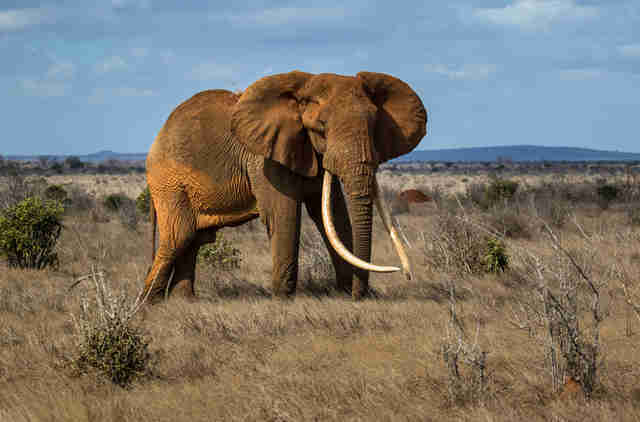 "In trophy hunts, the elephants sought out are large males with big tusks as these make for the more ‘impressive’ kill," a spokesperson from the David Sheldrick Wildlife Trust (DSWT), an organization that helps elephants by raising calves orphaned by poachers, told The Dodo. "However, these older males are in fact the primary breeders and their size and age is in itself an indicator of their genetic health. Taking out these males removes this strong gene pool from wild populations, compromising the next generation of a species already in worrying decline." "Human greed continues to outweigh the value of life," Scott Blaise, CEO of the Global Sanctuary for Elephants (GSE), told The Dodo. "There are few elephants of this iconic status who remain; as trophy hunters take them out one by one, elephants as we know them may be forever changed." The Zimbabwe Professional Hunters and Guides Association (ZPHGA) is calling the death of this elephant “a genuine mistake due to a lack of communication.” A photo of the hunter, who reportedly traveled from Russia to participate in the hunt, has surfaced, showing him standing proudly beside the dead elephant. "Considering all we know about elephants, their sentience, their family structures and emotional capacity, trophy hunting is utterly unjustifiable and belongs in the past," the DSWT spokesperson said. "For this elephant, his collar should have afforded him a safety net. Now, however, we’ll no longer be able to learn from this bull whose life was spent for the thrill of a kill." To call for stricter protections of elephants and animals collared for research, you can sign this petition. You can also help elephants by donating to DSWT and to GSE.